Why is it that people can attend church, revivals, Bible conferences, seminars, and retreats and never change? They hear wise men deliver great and true messages. They want to change, they resolve to change, but never do. How is it that people can buy good and helpful books, tapes, courses, and materials and still not change? The problem is not with the meetings, the men, the messages or the materials; the problem lies in the mind and heart of the person wanting to change. We are always moving in the direction of our thinking. If we want to change, we must change our thinking (Proverbs 4:23-27, 23:7; Romans 12:2, II Corinthians 3:18; Ephesians 4:22-24). The Holy Spirit uses the Word to change us. However, He will only change us if we cooperate by yielding and providing the building materials. Memorizing Scripture is the fastest, easiest way to change. The more you memorize, review, and meditate, the faster the Holy Spirit will perform the work of changing you. Go over the verse until you can quote it word perfect, with the reference, from memory. When you can say it from memory, quote it aloud 25 times the first day with reference. Write the date and "25" on the back of the card. The next day, after getting the verse back in mind, quote it aloud with the reference "20" times. The third day quote it "15" times; the fourth day, "10" times; the fifth day "5" times. (Write the numbers on the back of the card each day.) Then review it once a day for 45 days, once a week for 7 weeks, and once a month thereafter. You are adding a new verse each day; so at the end of 50 days, you have a pack of 50 verses. The new verse is quoted 25 times, the next verse is quoted 20 times, the next 15, the next 10, the next 5. The remaining 45 verses are quoted once each. This process will take about 30 minutes a day with average size verses. 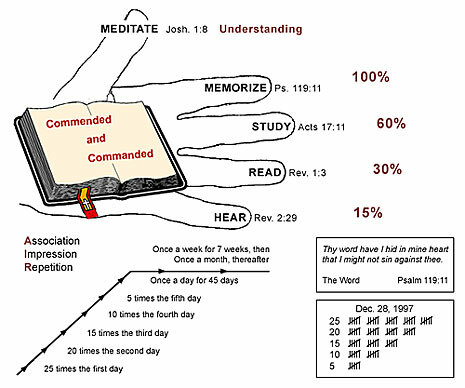 Memorizing one verse per week will take about 10 minutes per day or less. The date will assist you in keeping the verses in the order they were memorized so each will be reviewed for 50 days before being moved to the weekly review. The hill of memory places the process on a chart: Please note chart below. All five of these methods of retaining Scripture are both commended and commanded in the Word of God. They are not optional but are obligation. They are binding upon every believer. Let's let the fingers on the hand represent the different ways in which we can grip the sword of the Spirit which is the Word of God. The drawing of the hand points out that we remember about 15% of what we hear 24 hours after we heart it. We remember about 30% of what we read and about 60% of what we study; but we remember 100% of what we memorize and review.